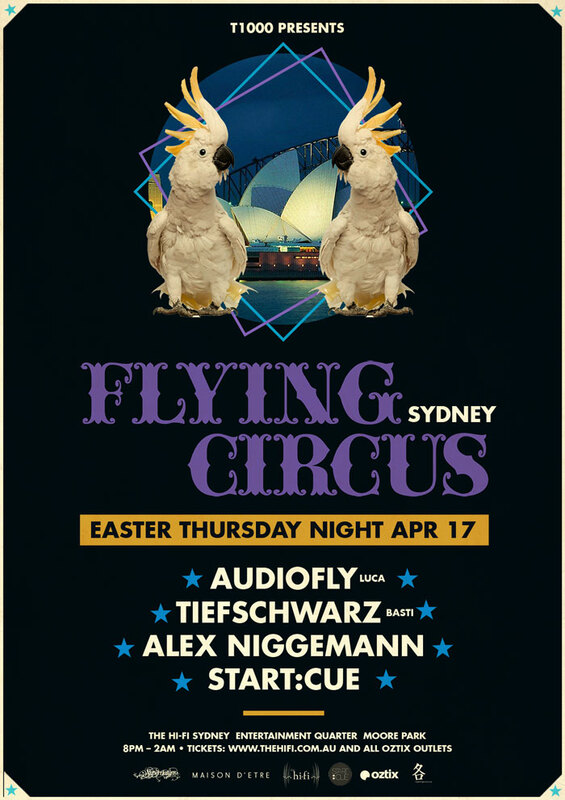 Global party brand Flying Circus is making its Australian debut on Easter Thursday April 17 at Sydney’s Hi-Fi venue. With appearances in over 30 countries worldwide, beckoning over 100,000 party-goers to their events it is now Australia’s turn. Headliners for the first event are : Audiofly (Luca), Tiefschwarz (Basti), Alex Niggemann plus Start:Cue (biographies below). Last year’s Ibiza summer residency at Sankey’s added credence to all the hype; bringing in names to the musical epicenter like Carl Craig, Little Dragon, Martin Buttrich, Lee Burridge, Tiefschwarz, Benoit & Sergio, Steve Bug, Dop, Blond:ish, M.A.N.D.Y, Robag Wruhme, Matthew Johnson, Finnabassen & DJ Tennis. Craig, Clockwork, , Davide Squillace, dOP, Jamie Jones, Guti, Guy Gerber, Lee Burridge, M.A.N.D.Y., Martin Buttrich, Nina Kraviz, Soul Clap, Steve Bug, Jamie Jones, Steve Lawler, Tale of Us, Tiefschwarz, tINI and many more…. The Flying Circus concept was birthed, like all the best ideas, by accident. The aim? To celebrate life with good people while enjoying great music. Simple. Flying Circus brings together the music loving family to climb the walls in primal elation, surrendering our bodies to pure auditory joy. It’s primal and gritty and speaks to your soul with no glossy adjectives. In the true fashion of a travelling circus the touring party has amassed a cult like following, a tribe of music aficionados, jetsetters, sun-seekers, revelers and connoisseurs of good vibes. The parties’ far flung organic locations, and dedication to keepin’ it real speak in resonant bass and cattle bells to a primitive desire to immerse our ears in sound and let our bodies go. Persistent, stubborn, straight ahead! – Alex Niggemann can be best described as idiosyncratic, impulsive and self-critical. What might be construed as negative for some people, are attributes that have paved the way to a remarkable career for this DJ and producer. Born 1984 in Dusseldorf, Niggemann is a producer, DJ and label owner. His development until 2010 reflects a fairly traditional approach to becoming a DJ. At the same time, his career represents a very personal evolution. Alex is erratic – in a truly human way. In the nineties, his impulsiveness led him to discover that playing classical piano was indeed very limiting. This motivated him to search for a more rewarding means of self-expression. As a teenager, he dressed in typical hip-hop fashion and spent his time focusing on rap and style-writing. When he was fifteen, his older brother took him to a techno party. This became the turning point for the young, headstrong musician and pointed the way in a new direction. By the time he was sixteen, Alex had picked up some turntables and transformed his room into a studio. The DJ scene in Dusseldorf was a close- knit network in 2000. Not everyone with talent who knocked on the door was invited to take his place on the DJ decks in the local clubs. His solid reputation has opened the door to some of the world‘s leading, most influential clubs, including Ibiza‘s “Space” & “Privilege”, “D-Edge” Brasil and Watergate in Berlin. One of the things that distinguishes Alex Niggemann‘s style is that it‘s hard to define. This headstrong producer isn‘t inte- rested in sub-genres and likes to describe himself as a House DJ. He produces and plays whatever suits him at the moment: from dark tech house to vocal-heavy house music. Either way, he‘s always right on target with the club crowds who dance to his music all night long – all over the world. Wherever his mood takes him, the club scene will be paying close attention to what comes next on Alex Niggemann‘s turntables. In 2011 he caught Steve Bug’s attention resulting in his EP “Lately” being released on Poker Flat followed by his debut longplayer “Paranoid Funk” on in June 2012.In his own words Alex set out to “create an album which is different to typical club or listening albums, where songs fit together (even when having different styles) without being too similar“. He also goes on to say that it‘s very much about “showing the full range of what I‘m able to, what I have done, what I like and what I will do.“ – It’s not hard to believe him, as it‘s a rather eclectic 4/4 album packed with groovy, feel-good house that still offers more hypnotic and darker moments along the way. Supporting the Flying Circus DJs will be local DEEP HOUSE DJs START:CUE. Born in 2012, with the sole purpose of giving eastern suburbs what it deserves – a top drawer deep house offering. Bringing together exciting new headliners with the best resident DJs and crowd that Sydney has to offer, their events have received wide acclaim and a loyal following in a short space of time. Born and bred in Stuttgart, brothers Ali and Basti Schwarz’s passion for techno and deep house flourished their initial experience as DJs in the early 90’s at the now legendary clubs that Ali ran in their home town, ON –U and Red Dog. This led to the formation of Tiefschwarz in 1997, from which they found rapid success with their debut single ‘Music’ (on Francois K’s Wave Music label) and album Ral 9005. By 2001, this had been licensed to the London label Classic Recordings from where they springboarded to international recognition. They decided to make the move to Berlin, at the time fast becoming the epicentre of a true electronic music renaissance, from where they pursued a hectic touring schedule and remixing the likes of Cassius, The Rapture, Missy Elliott, Kelis and their personal heroes Masters At Work. They then scored a double whammy with their all-conquering crossover hit remix of Spektrum’s ‘Kinda New’ and the single ‘Isst’ off their 2005 long-player, ‘Eat Books’. This was also the year that electrohouse dominated the charts and minimal the clubs, but Tiefschwarz have never allowed themselves to be tied down to a certain sound, staying true to their love of melody as demonstrated on their contribution to the Fabric mix series that year. A series of high profile mixes in 2006, including Depeche Mode, Madonna, Roxy Music, Booka Shade, Phonique, Plastikman, dOP, and many others saw them continue perfecting their distinctive sound. Yet this was also the year in which Ali and Basti gravitated back to Berlin to found their own label, Souvenir. Basti explains “We like the idea of seeing music as a souvenir, an impression you take from somewhere. Something intimate that you remember”. They haven’t let this slow down their impressive production workload though, with a ten year anniversary compilation and a 2010 follow up album ‘Chocolate’ made in collaboration with Santé, and featuring Cassy, Seth Troxler, Dave Aju amongst others. At a perfect time to take stock of their career, the brothers are proudly contributing the ninth installment in the Watergate mix series, and have chosen a number of tracks that simultaneously pay homage to the tracks that shaped the beginnings of their career whilst also remaining very much forward looking. Although widely regarded as a member of the true A-list of dance music, both in terms of production, DJing and label management, it was a chance meeting led to Anthony Middleton and Luca Saporito, an audio engineer/musician and working dj respectively, becoming Audiofly back in 2002. Middleton was, in typical boffin style, experimenting with live surround sound while Saporito was acting as in-house music selector at prestigious London store Selfridges but the pair decided to down tools and throw everything at their shared love of house music. A bold move, but one which immediately began to pay off. The Audiofly name started to crop up regularly in the London scene and beyond via a series of edits, remixes and releases for underground imprints such as Fantastic House and Deleted. This initial hype led to Peace Division and DC10 resident Clive Henry to request an EP for the now legendary Low Pressings imprint. This EP, entitled “Release Yourself” caught many an ear and coupled with the DJs growing reputation as DJs, propelled Audiofly to a new level. Fairly quickly the pair’s groovy, melodic and undulating take on house music started to create a huge fan base, both in the press (DJ Magazine featured the duo on a special covermount CD), in clubs (Space Ibiza residency) and finally in production, with uber-imprints Get Physical, Mood Music, Kickboxer and Renaissance calling on their talents. Now, the duo are pushing their sound even further with a gig diary that takes in the likes of Fabric, Warung, Amnesia and countless other world renowned clubs as well as a forthcoming album in the works but they still finding time to develop other artists via their own Supernature imprint.